I saw the musical Avenue Q last night, and while I found it entertaining, original and funny, I also found some lessons for speakers! 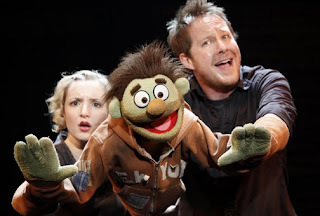 In Avenue Q, the puppets are handheld on stage by the actors who play them. The puppets, while technically the stars of the show, would be useless without the bodies and voices of the actors. It takes a few minutes to get the hang of mentally integrating both the puppet actions and the actors' facial expressions and movement, but then it works. A lot of speakers have a fear of appearing fallible. They want to hide their notes or not use any. They fear making a mistake or having to deal with a technological problem, possibly revealing a flaw in the preparation of their presentation. If everything doesn't go exactly as planned, the presentation is a "failure" or "disaster." Unless you're a magician, there's no need for elaborate illusions. Let go of your notions of perfection. So the audience sees that you have notes. As long as the notes aren't crippling the flow of your presentation or creating a distraction for you, who cares if they're sitting on the lectern off to the side? As long as you integrate your tools and don't blow your cool if something goes wrong, the audience will be fine with seeing the strings and gears of your presentation. Avenue Q uses video screens at strategic times during the show to illustrate scenes and songs, as an educational tool in the same way that Sesame Street taught us that "C" is for cookie. For example, there is a song about schadenfreude, which is helpfully broken down for pronunciation on the monitor. In another scene, we see five illustrated nightstands on the monitor, and count down to "one night stand." (Get it?) And when Princeton, the main character, forgets what he's looking for, the monitors drop down and remind us, with just the word "Purpose." Never forget that you, the speaker, are the presentation. Your visuals enhance your presentation, but are NOT the presentation. If your PowerPoint was the presentation, you could e-mail hard copies to everyone and tell them to stay home. Visuals can be helpful in illustrating your points, adding humor, demonstrating data and more. But you are the focus and the center of attention. Don't let your visuals overwhelm you or the audience. One of the songs in Avenue Q is titled, "Everyone's a Little Bit Racist." Another song says, "The more you love someone, the more you want to kill him." The more you want to kill 'em. You like to make him die! The more he make you crazy. The more you wishing him dead! For hitting him on his head!" Both of these songs have elements that might surprise and even shock the audience, because they're saying things that people often think, but would never say out loud. 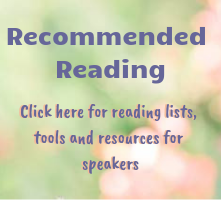 How can you wake up your audience with a story, statistic or activity that might use surprise or shock to help them learn something new or grasp a difficult concept? I wouldn't do this gratuitously; this is a tool that works best when there's a sincere and legitimate reason for it. Otherwise, your audience might end up feeling manipulated and confused or angry. Okay, Avenue Q is a Broadway musical. It's supposed to be entertaining. But if you notice, many of the movies, TV shows and plays we watch have a greater message, yet we are still entertained by them. In fact, it's the entertaining quality that allows us to more easily absorb the message. Avenue Q's main message is that, while life is hard and there are no easy answers, everything (good and bad) is "only for now." And we'll accept the things we cannot avoid, for now..."
As a speaker, you can pound your audience over the head with facts, figures, numbers and charts. You can maintain a serious demeanor in the hopes of convincing the audience of the importance of your message. Or, you can find ways to have some fun and make your presentation actually enjoyable to your audience while still making your points. 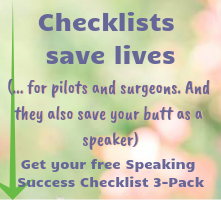 What lessons have you learned in surprising places about speaking?